Using public transport is the most comfortable and practical way of getting around Madrid. In the Spanish capital it can be very difficult to find places to park, and during rush hour traffic can be fairly chaotic. Because of this, we recommend that you park the car and get to know the city using public transport. Madrid has a good network of buses, three tram lines, various local stopping trains and a wide metro network. The metro is the most popular and widely-used means of transport in Madrid. And you already know that when in Rome (or Madrid), you should do as the locals do. 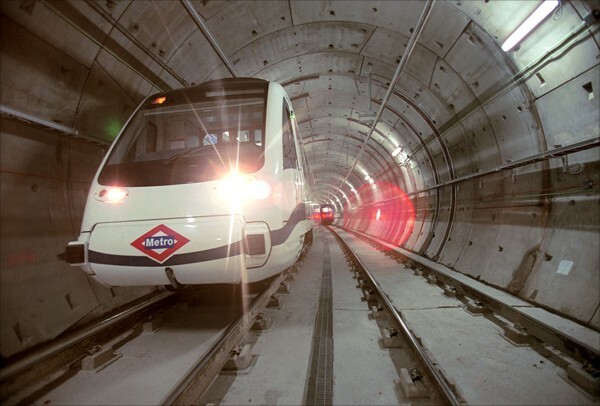 Opened in 1919, the Madrid metro is the oldest and most extensive in Spain. It’s got 12 different lines and more than 230 stops, many of which deserve a visit if only for their design. The old-fashioned architecture of some contrasts with the modernity of the rest of the metro, which has received various international prizes for its technological innovation. The Madrid metro also has various phantom stops. The most famous of them, Chamberí station, has now been converted into a museum, where you can learn about the metro in its early days. The Madrid metro opening hours are from 6 am to 1.30 am every day of the year, with the exception of Pitis (line 7) and the stretch between Puerto de Arganda-Arganda del Rey (line 9). In rush hour, trains leave at a frequency of 3 – 4 minutes. There’s many different types of tickets, so we’re not going to write about all of them. A single costs € 1.50, and a ten-journey ticket € 12. You can consult the rest of the fares here, and season tickets here. Children under four go free. The tourist transport season ticket can be used on all means of transport in the Madrid area, for unlimited journeys. It includes a map of Madrid, with main points of interest market, and a plan of the metro and local train services. The tourist season ticket is valid for 1, 2, 3, 5 or 7 days. One day costs € 8 and 7 days € 66.80. …and so that you don’t get lost, and arrive at your destination in time, here you can download a PDF with a plan of the metro of Madrid. Enjoy your journey!